It all begins with a ball of clay. We’ll start you off with a pound of it and roll it out flat through our slab roller. Each pound will roll out to approximately a million by a million inches or enough to cut out anywhere from 6 to 8 cookie sized (3″-4″) ornaments. Your welcome to use any of the shapes we have at the studio or to bring your own. We’re using plain old cookie cutters so if you have any special shapes your family uses during the holidays bring them along. The clay washes right off. 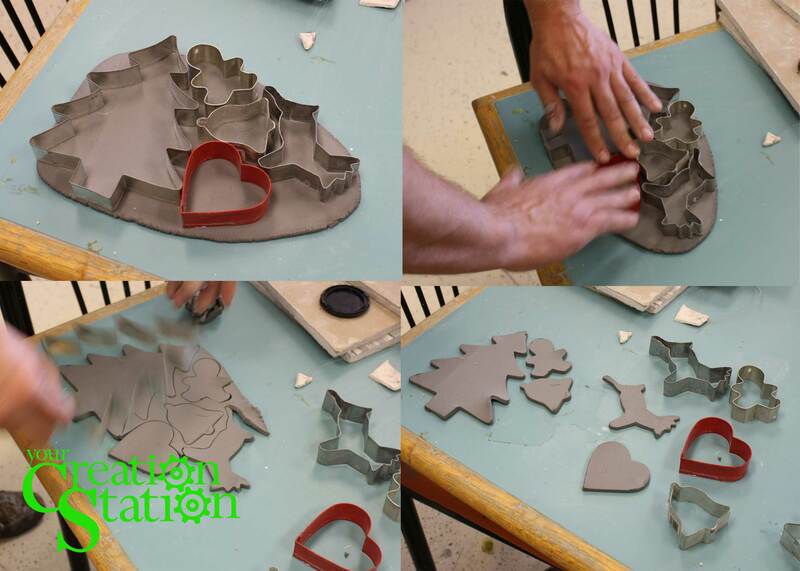 Layout the cookie cutters on the clay, press them in and remove the extra. Once the ornaments have been cut out, you can customize them any way you like by adding extra clay, pressing fabric or other texture into the clay, carving designs…its totally up to you. You’re limited only by your imagination! The time to work with the clay is at this stage when its wet so do anything you want to the piece now. Before you finish, make sure you carve your initials into the piece and put a hole in top to hang it from. If you write the year on it, you’ll always remember when you did it. 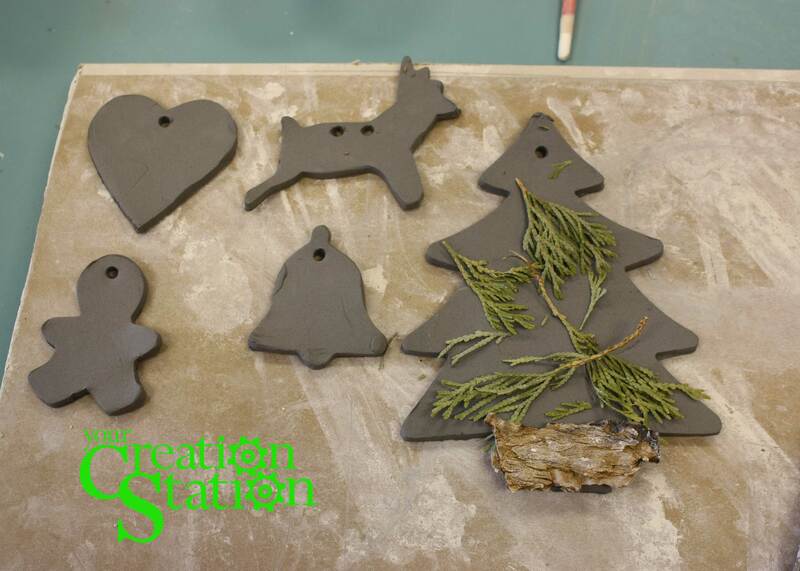 After you make the ornaments, you’ll leave them at Your Creation Station to dry and be bisque fired. The bisque fire is what changes the clay into pottery. Without going into the nitty-gritty of what happens and why, suffice it to say, this turns the clay white and hard. 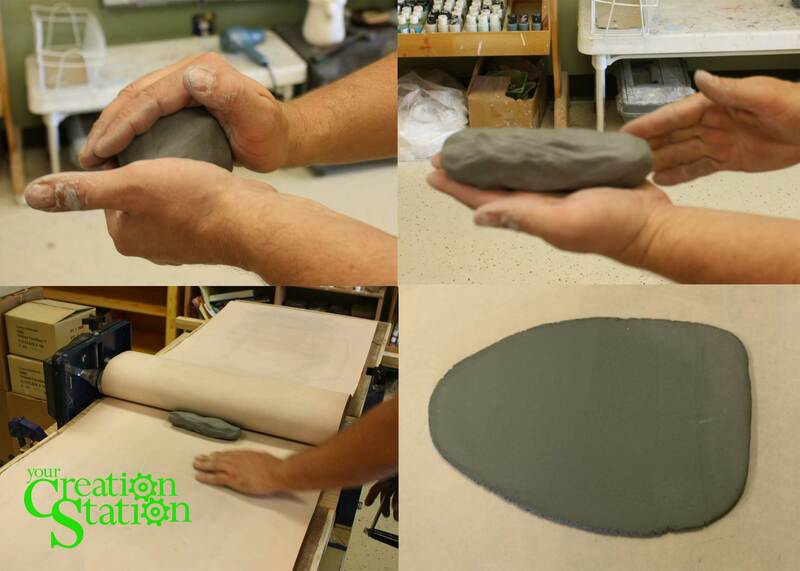 Drying takes approximately anywhere from 2 to 4 days and the clay needs to be completely bone dry before it can be fired. The bone dry pieces will go into the next kiln load. 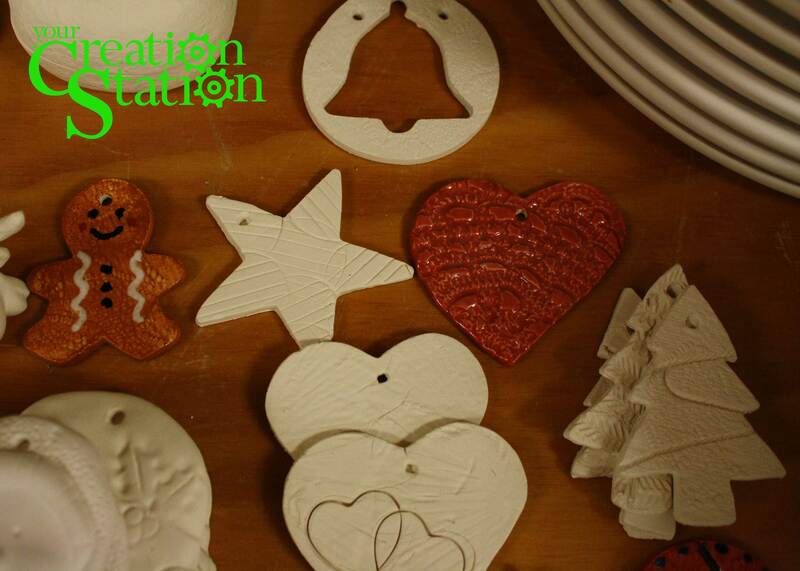 Once its been bisque fired, you can come back and paint your ornaments any colors you like. We have over 90 underglaze colors and about a dozen specialty glazes to choose from. When your done, we’ll glaze and fire the pieces again. We’re usually pretty busy during the holiday season so it’s never more than a day or two until the next fire. This project a fun and affordable way for the whole family to make ornaments for home, gifts, stocking stuffers or just to keep. Each pound of clay costs $25 and should yield 6 to 8 cookie sized ornaments with extra clay to add any embellishments you would like to make. Plan on two trips to the studio to finish the project, one to make and one to paint, with about week between visits. Check our home page, our Facebook page or stop by the store for a list of workshop dates. Even better just come in and start making ornaments!